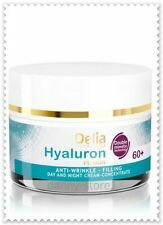 Delia HYALURON FUSION CREAM CONCENTRATE 60 . MOLECULAR PEPTIDES and COLLAGEN. Of course always possible to obtain a delay for various reasons. Trending at C $12.66eBay determines this price through a machine-learned model of the product's sale prices within the last 90 days. The skin's barrier function is strengthened to help protect the skin from becoming dry. The exquisite formula feels lightweight and non-greasy. Use on cheekbones to highlight key areas. Use as a nightly massage alone or under the night cream for an extraordinary luxurious ritual. OLAY TOTAL EFFECTS 7 in ONE ANTI AGING MOISTURISER. HERE FOR SALE 2 TOGETHER. BOTH ARE 15ml & BOTH SPF15..TRAVEL SIZE. BRAND NEW UNOPENED IN BOXES. 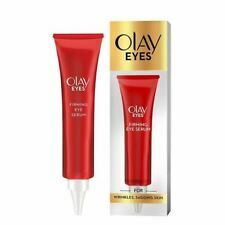 Reveal younger looking eyes with Olay Eyes Firming Eye Serum. This daily anti-ageing serum is specifically designed for the delicate skin around the eye area. Instantly hydrates to plum sagging skin. Trending at C $17.49eBay determines this price through a machine-learned model of the product's sale prices within the last 90 days. Elemis Pro-Collagen Marine Cream 50ml. This revolutionary anti-aging cream took three years to develop! Elemis Pro Collagen Marine Cream uses the maximum concentrate of powerful marine extract Padina Pavonica to transform your skin. Trending at C $97.33eBay determines this price through a machine-learned model of the product's sale prices within the last 90 days. 100% authentic, new and sealed product. Elemis Pro-Radiance Illuminating Flash Balm 50ml. 100% authentic, new and sealed product. Doing that is against U.S. and international laws. L'Oreal RevitaLift Night Cream 50ml. 100% authentic, new and sealed product. L'Oreal Revitalift Laser Renew Super Anti-Age Serum 30ml. 100% authentic, new and sealed product. Doing that is against U.S. and international laws. Skin rejuvenated overnight for best effect. Trending at C $22.66eBay determines this price through a machine-learned model of the product's sale prices within the last 90 days. Bag will automatically be added to your order. (Bag worth £7). Sealed Alpha-H Liquid Gold with Glycolic Acid travel size 50ml. RRP of a full size (100ml) is £33.50. Enriched with glycolic acid and anti-inflammatory ingredients. morning and evening. If there is no manufacturer's seal on the product. L'Oreal Skin Perfection Advanced Correcting Serum 30ml Refining Skincare. Condition is New. Dispatched with Royal Mail 1st Class. The L'Oreal laboratories have developed a 3D Skin Quality Index. Enriched with: LR 2412, a powerful active from 10 years of research, optimises the structure of the epidermis to improve the quality of skin's appearance.